Kia ora and Welcome to Term 3! What glorious Autumn weather we have had this term. Our programme has been very busy this month with children getting out amongest the fallen leaves at Forest Education, preparing and making soup at Playgroup and enjoying a fun filled morning at the Air Force Museum. As we head into winter, please remember to bring warm clothing for outside exploration and lets keep those winter bugs away! New feedback forms were sent out early July to all families of children who have had a birthday this year to date. Moving forward these will be sent out in the month of your child’s birthday to give you a more formal way of inputting into your child’s programme. Please do take the time to express your wishes and hopes for your child’s learning for the upcoming year. We truly value a collaborative approach to your child’s learning and our aim is to ensure family wishes and aspirations are acknowledged and respected. We ask these to be emailed back to Louise, who will then share them with your educator. Organic Kids Educators are attending Yeah Baby. This is a specialist conference concerned with the education and care of our infants from birth to three year of age. All Educators have been invited to attend this fantastic professional development opportunity with us. The conference includes six 45 minute workshops on current topics relating to teaching in the early childhood sector, we are all looking forward to this new learning to provoke further inspiration in our teaching. Another great term at Organic Kids playgroup as we work with the children supporting their interests and stages of development. This term we were celebrating a successful harvest and a new growing season due to Matariki – the Maori New Year. We made soup one morning where the children were able to use kitchen utensils such as a peeler, grater and vegetable knives. The children then took their soup home to eat for lunch. We have been looking for a venue for an Oxford Playgroup, until we find one Katrina has kindly offered her home. 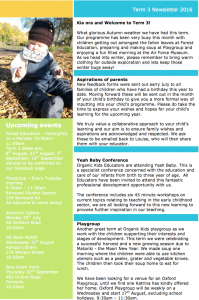 Oxford Playgroup will be weekly on a Wednesday and start 17th August, excluding school holidays. 9:30am – 11:30am.